ABS versions have a flammability rating of UL94-HB for indoor use. Polycarbonate versions are UV stabilized for outdoor use. The grey material has a UL94-5VA rating, clear and smoked lids UL94V-0. Lid is secured with self-captivated M4 stainless steel machine screws, threaded into integral stainless steel bushings for repetitive assembly and disassembly. M3 threaded brass inserts and/or standoffs for PCB or inner panel mounting in all but the smallest B size. Vertical PCB guides in all but the smallest B size. 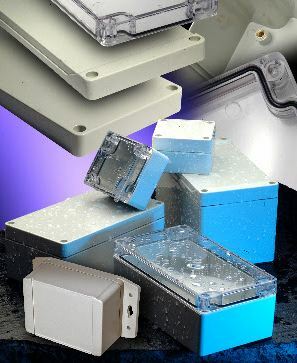 Posted in Product News and tagged 1554 Series Enclosures, 1555 Series Enclosures, ABS, Hammond Manufacturing, Polycarbonate, UL94-HB, UL94V-0.